How to use SuperSync to transfer music, remove duplicates, and compare libraries. How to sync with your NAS. 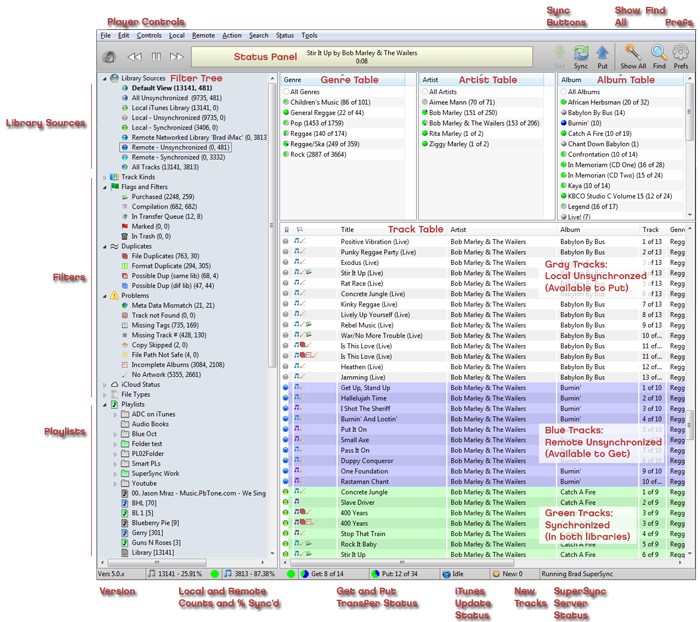 SuperSync is software for Mac and Windows that lets you compare and merge all of your music libraries on multiple computers and devices. If you have music and video libraries at home, the office, on laptops, on iPods, iPhones, and disk drives, SuperSync can help you move and sync your iTunes content from one library to another, easily and intuitively. SuperSync can read a single library or two libraries at the same time. In SuperSync, we refer to these libraries as the Local and Remote Libraries. Once SuperSync reads your library/libraries, you can use the SuperSync's Get, Put, and Sync actions to move music between your two libraries. The Local Library is a music library on the machine that SuperSync is running on. By default, the Local Library is set to read the iTunes Library on that machine. For example, if you run SuperSync on your laptop, SuperSync will connect to that laptop's iTunes Library. Note: The Local Library can also be set to other types libraries. This is an advanced topic that is discussed in detail in the "Configuring the SuperSync Local Library" section in this manual. The Remote library is the one you are comparing your Local Library. In most cases, the Remote Library will be the music library from another computer running SuperSync. For example, if you have a laptop and a desktop both running SuperSync, the desktop will be the Remote Library for the laptop. Note: The Remote Library can also be set to other types libraries such as an iPod, another hard drive, or another networked computer running SuperSync. This is an advanced topic that is discussed in detail in the "Configuring the SuperSync Remote Library" section in this manual. Tech Info: SuperSync is a client/server application. The SuperSync server is turned on/enabled by default so that SuperSync computers can connect to each other. You can enable/disable the SuperSync Server feature in SuperSync's Preferences window. To access a SuperSync computer from outside your firewall, you'll need to know a little more about IP addresses and port numbers, which is described in more detail in the SuperSync Server and WAN Access sections later in this manual. The Local and Remote Libraries are two distinct libraries that may contain some, or all, or no tracks in common. That's where SuperSync comes in. SuperSync connects the two libraries and and lets you compare and sync tracks between the two libraries. The SuperSync window is where you can play, compare, search, and sync tracks from different libraries. It also gives provides the status of various SuperSync features and actions such as transfer status, SuperSync Server status, iTunes actions, etc. Note: More information about this window and it's features/actions can be found in the "SuperSync Window" section in this manual. Green dot: Synchronized track. Track is in both Local and Remote libraries. Turquoise dot: Synchronized track. Track is in both Local and Remote libraries. Turquoise tracks are usually omitted so that you don't see two of every synchronized track. This action Syncs the selected content between the two libraries so content matches on both computers. Note: You can use Get, Put, and Sync on a single track, tracks from an artist, genre, etc., and tracks of a particular type (e.g. MP3, M4A, etc.) or on an entire library. SuperSync groups your libraries' content in standard groups/views such as Music, Movies, TV Shows, etc. In addition to these, SuperSync also groups songs by other criteria such as File Duplicates (tracks that are identical), Possible Duplicates (tracks that are very similar based but don't aren't an exact duplicate), tracks without artwork, tracks with missing track numbers, etc. In the SuperSync Window, you can use the Filter Tree to select tracks these groups/views to quickly identify tracks that you may not want to transfer between your libraries. By using SuperSync's Get Info, Compare Tracks, Track Comparison, Remove Duplicates, and Put in Trash/Empty Trash features, you can get additional info about your tracks so you can determine which files to keep, ignore, fix, and/or delete. Listen to Your Libraries From Anywhere! In addition to all the features listed above, SuperSync allows your library to viewed/listened to from any device that has a web browser. SuperSync's Web Server feature publishes your Local Library via a web interface. You can then point any computer with a web browser to special SuperSync website and view and listen to your content. Note: SuperSync's Web Server feature is enabled by default but it can be disabled/enabled in SuperSync's Preferences window in the Network tab. Tech Info: The SuperSync Web Server is typically only available to computers on your local network and not computers from outside your network (e.g. computers on the internet). If you wish to publish your Local Library to computer's outside your network, you will need to make sure your computer is accessible from outside your network. Please read the WAN section in this manual for more information. We have now covered the basic concepts and features of SuperSync. Our next section, SuperSync Quick Setup Guide, provides step by step instructions on how to setup and use SuperSync for the first time. SuperSync is licensed for reproduction of non-copyrighted materials or materials the user is legally permitted to reproduce. iPod and iTunes are registered trademarks of Apple, Inc., which is unaffiliated with SuperSync. Please do not steal music.